Cider Celebrates The American Cheese Plate! As the American Cheese Society gathers in Sacramento for the annual ACS conference, (with over 1600+ cheeses and 100’s of makers, mongers and curd nerds), our resident cheesemonger – who tweets @ConsiderTheRind & writes on all things cheese at ConsiderTheRind.com – will be heading West to the Festival of Cheese. Along the ways she’ll stop at The Healdsburg SHED, to team up with Tilted Shed Ciderworks, Devoto Orchards Cider, Gypsy Cheese Co., & Weirauch Farm & Creamery on August 3rd, for what promises to be an exciting East Meets West Cider & Cheese Tasting Workshop, details here. Get your Brown Paper tickets here! For more details follow @craftyandbeast #ciderchat (TONIGHT) Thursday, July 24th, 6PM PST/9PM EST – we’ll be #ciderchatting about the upcoming cider & cheese event, and encourage all you cider & cheese fans to ‘pair up’ and create some tasting events of your own. Cider + Cheese and You. A Tasting with Tilted Shed Ciderworks and DeVoto Orchards Cider. When our resident Cheesemonger crafted a fantasy-cheese pairing featuring Tilted Shed Ciderworks 2012 GRAVIVA! Semidry Cider, our cider pen pals at Tilted Shed responded by hosting the First-Ever Sebastopol Cider and Cheese Challenge and invited Apple Sauced Cider to join in. You can read about their cider+cheese pairing adventures here. Actual Cider + Cheese Pairings are definitely more fun. Want to enjoy a guided cheese + cider pairing featuring Tilted Shed Ciderworks & Devoto Orchards Cider? You Can! Sign up for the upcoming SLOW FOOD RUSSIAN RIVER Benefit Event. Yes. The cider artisans and orchardists behind Apple Sauced Cider and Devoto Gardens are launching a new brand,: Devoto Orchards Cider. This first seasons releases of farmstead ciders will include: Gravenstein, 1976, and Cidre Noir. 5Ws of Cider: Scott Heath and Ellen Cavalli & Tilted Shed Ciderworks 2012 Graviva! Cider. WHO: Scott Heath, co-owner & cidermaker, and Ellen Cavalli, co-owner & sales and marketing director. Graviva! is our homage to the beleaguered, beautiful Gravenstein, which was Sonoma County’s main agricultural crop until post-WWII, when imported apples and eventually the wine industry put the squeeze on growers. Now there are around 600 acres left in cultivation, down from a few thousand just a couple of decades ago. It’s a blend of 50% Gravs with 50% heirloom and cider apples, including Hubbardston Nonesuch (a low-tannin, low-acid sweet from 1830s Massachusetts) and Nehou (a high-tannin, low-acid bittersweet from 1920s France), all organically grown on Sonoma County farms. It’s a lightly effervescent, bright, crisp cider with refreshing acidity, slight floral aroma, and a touch of sweetness and tannin. We hand-washed, sorted, ground, and pressed the apples from August to October 2012 at our small cidery in west Sonoma County. Then Scott sent the juice onto a cool, slow fermentation in small batches until late March 2012. Our process is more akin to white wine production; the long fermentation allows the cider to develop more nuance and aromatics, which may be lost in a fast, hot ferment. Then Scott blended it, aged it for a month, then began bottling by hand. We released Graviva! in early May, for a total of 400 gallons. WHAT TO PAIR WITH : Graviva! is fantastic as an aperitif, with cheeses (especially the sheep and cow dairy cheeses by our friends at Weirauch Farm & Creamery) and charcuterie. Its balance of acidity, sweetness, and tannin also makes it a great accompaniment to pork tenderloin, salmon, oysters, and spicy foods (especially curry dishes). I most like to pair it with is a hammock on a sunny day, but our most memorable pairing was with local salmon. We serve it lightly chilled; 50 to 55 degrees is the sweet spot for releasing the aromatics. WHEN & WHERE: The most memorable pairing we had with Graviva! was in late July 2012 at our house. Scott had just turned the Big 40, and we were three weeks away from launching our very first batches of ciders at Sebastopol’s Gravenstein Apple Fair. Early in the morning, Scott drove out to nearby Bodega Bay, where he bought a whole salmon straight off the fisherman’s boat. He smoked it in our wood smoker, and also made focaccia from scratch. Meanwhile, I picked and prepared a bunch of vegetables from our garden: cucumbers, carrots, green beans, and Sungold tomatoes. Our good friends and their kids came over, one friend brought the yummiest carrot cupcakes, we busted out a few as-yet-unlabeled bottles of Graviva! (we were still waiting to get the labels from the printer! ), feasted on the best salmon we’ve ever had, and had a fun, noisy dinner party on our deck. WHY: There is something inherently celebratory about Graviva! Not only did it make for a convivial dinner, it’s been poured instead of Champagne at weddings, and we recently served it on Mother’s Day as a toast to my mom. Note: The lovely chicken pictured is a Rhode Island Red, and her name is Big Red. The Gravenstein sparkles in this bright, crisp cider. The refreshing acidity is balanced with a touch of sweetness. 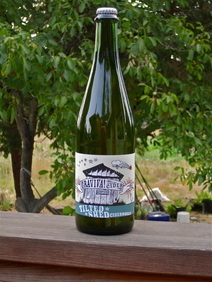 We sourced the Gravs and other heirloom cider apples for this blend from organic growers in the Sebastopol area. The Grav lends its lovely aromatics, while a mix of “bittersweet” apples—which were specially developed over the centuries for fermented cider—imparts lively tannins. This is Sonoma County heritage in a bottle. Viva la Grav!Great as an aperitif or celebratory bubbly, or pair with aged cheeses, spicy foods, and a hammock. Silver medal winner at the 2013 Great Lakes International Cider and Perry Competition. The 5Ws of Cider Pairing. The 5Ws is a recently launched feature where we ask cider makers to share their favorite cider & pairing. We give you the brand, the cider, and pairing from some of Americas most interesting craft cider makers. We think makers who take the time to craft a well made cider, probably have some pretty interesting pairing suggestions.